Was born in 1867, and succeeded to the earldom at the death of his father in 1885. He is a keen and practical yachtsman. Commencing with Dacia, a 5-rater, which he raced with great success, he became an expert helmsman. Dacia was designed by C. Nicholson, jun., in 1892. Nicholson was then a practically unknown designer, but so successful was Dacia that she brought about a revolution in her class, and put an end to the supremacy which Mr. Payne had for some time enjoyed. She was originally built for Mr. R. H. Langrishe, but early in the season she was bought at a high figure by Earl Dudley. Out of thirty-one starts in that season she won twenty-three first prizes and four others, and beat the Watson crack Natica. The match between Dacia and Natica took place at Torbay for heavy stakes. Earl Dudley, who, as a rule, steered his craft in these races, handed the tiller over to Mr. Nicholson, and Dacia won. In the following year Mr. Fife, jun., turned out Red Lancer, and Dacia met a tough match. In that year out of twenty-seven starts she won twelve first prizes and ten others. Earl Dudley next built the 20-rater Vigorna, but Dragon III, and Deirdré were much speedier boats, and she failed to carry off prizes in the class. Undeterred by this disappointment, he gave an order to Nicholson, and Inyoni was built. The competition in the class was one of the keenest, and Inyoni dis­played such good qualities that she was able to make a fair average as a prize-winner, though she started badly, and was on several occasions altered. Earl Dudley, as Viceroy of Ireland, greatly encouraged yachting there. In Dublin Bay in the seasons of 1903 and 1904 Earl Dudley sailed the 25-footer Fodhla, built by Doyle of Kingstown, which did very well, winning a fair share of prizes. During the seasons of 1905 and 1906 he has had much sport on Lough Erne. 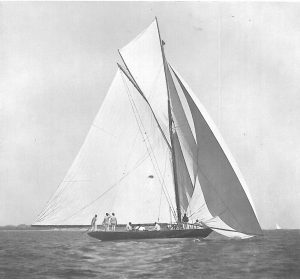 W. Fife, jun., of Fairlie, built to his order in 1905 the 2-rater Vanessa, which in her first season carried off more prizes than any other boat. In the same season he also bought two other new boats besides Vanessa—Foam (built by Payne) and Breeze (built by Mylne). Earl Dudley has had the same skipper (Mountfield of Gosport) in Inyoni, Vigorna, Fodhla, Vanessa, and Maive. Earl Dudley went round the world in the s.y. Marchesa in 1885 and 1886, which was chartered for the purpose. Clubs: Royal Yacht Squadron, Portsmouth Corinthian, Royal St. George, Dublin Bay Sailing, and Lough Erne.